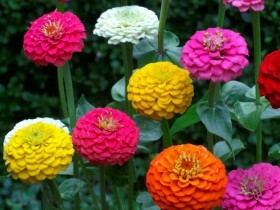 In the photo: a riot of colors – zinnias in the garden. Discreet and modest flowers zinnias – the epitome of beauty of the area in the middle of summer. In people, these flowers are called "majors". But all known plants have gained their place on the planet not only because of its attractiveness. Additional advantages make you love this culture even more. Palette of colors – all colors, except the blue. 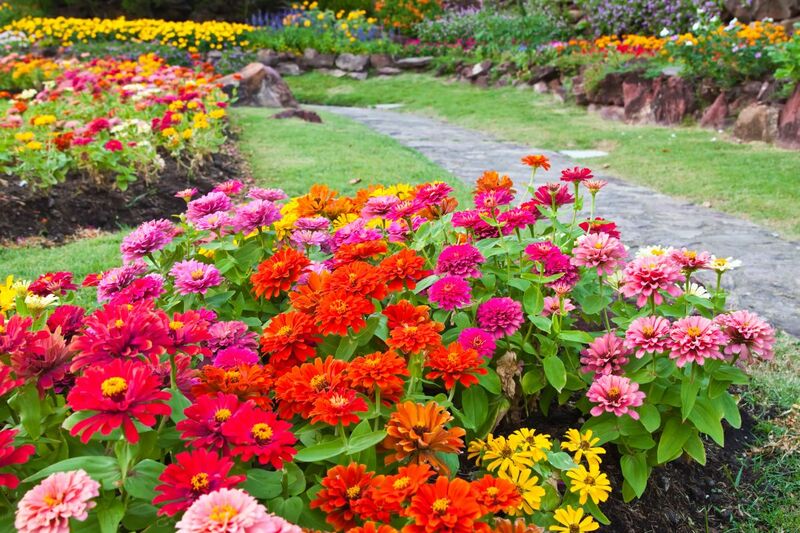 Zinnia goes well with annual and perennial plants, herbs. Not less widely represented size among species and varieties is as low, and high instances. Such diversity will help the grower to implement any ideas on arrangement of the site. Zinnias are undemanding, they like to visit the butterflies and birds. Flowers you can pinch off, the more removed, the more there will be new buds. The genus of this culture has two dozen types, in the wild they grow in South and Central America. 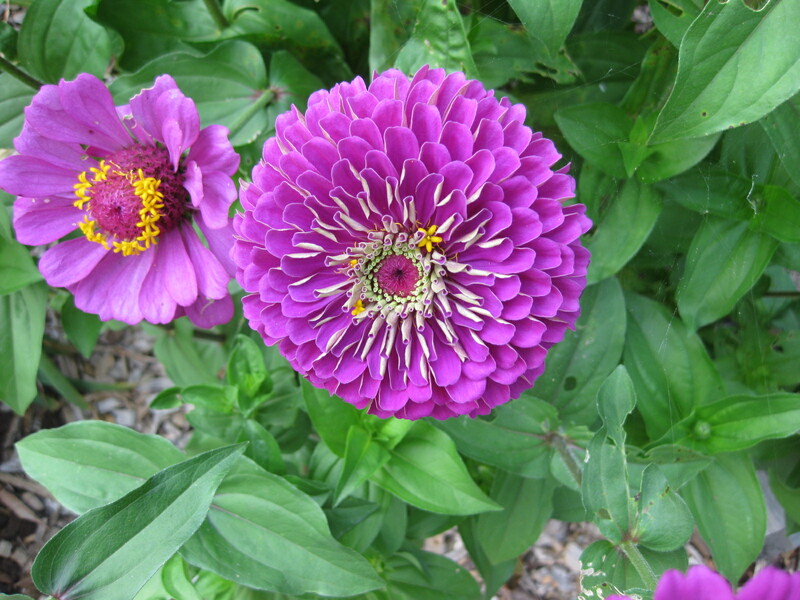 Zinnia can be perennial and annual, subshrub and herbaceous. Leaves ovate, inflorescence – baskets, large, sessile or on long stalks. Marginal flowers variously colored: they can be white, red, pink, lilac, purple. Fruit – achene. 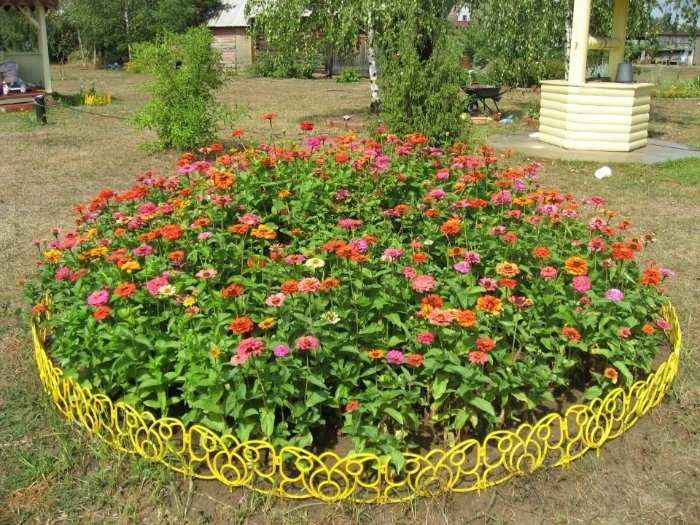 In the landscaping of the garden or land used and elegant zinnia zinnia uzkolisty. Very popular culture enjoys in the United States, breeders displayed a lot of varieties, resistant to heat and bright colors. 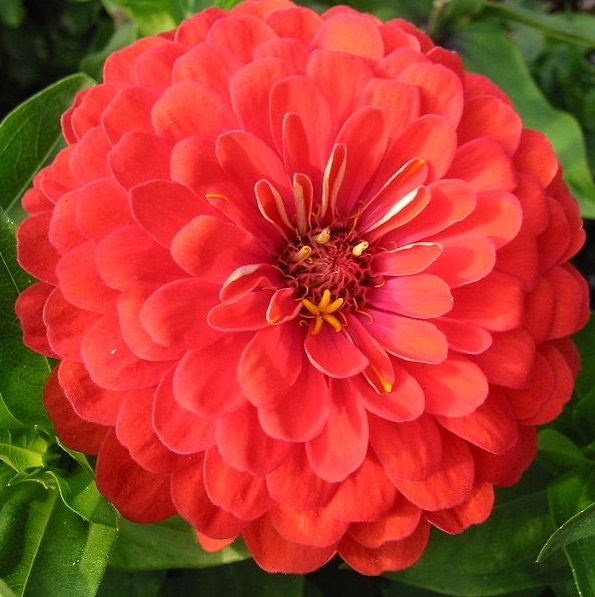 Zinnia is a heat – loving and photophilous plant, it does not tolerate frost. For normal development and flowering requires a neutral fertile soil. The plot is dug over, contribute to soil humus, leaf mold or compost in a bucket per square meter. Add superphosphate, the nitrophoska and sulphate of potash, substances contribute in equal proportions, then the soil once dug to a depth of ten. The plant feels good in the sun, needs protection from wind. 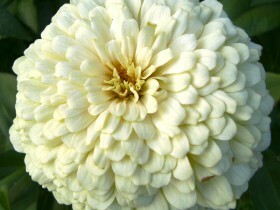 Zinnia does not tolerate prolonged drought, and excess moisture. In that and in other case the flowers get smaller. Responds well to application of mineral and organic fertilizers, feedings are two to three times per season. The first feeding to the beginning of budding: in a bucket of water or two tablespoons of organic fertilizer for flowers, tablespoon of urea. The second fertilizing at the beginning of budding: in a bucket of water by the spoonful "Agricola" and liquid fertilizer. Before fertilizing the soil may be sprinkled with wood ashes, after the appearance of flowers in the plant sprayed with "Bud" is based: 10 g in a bucket of water. 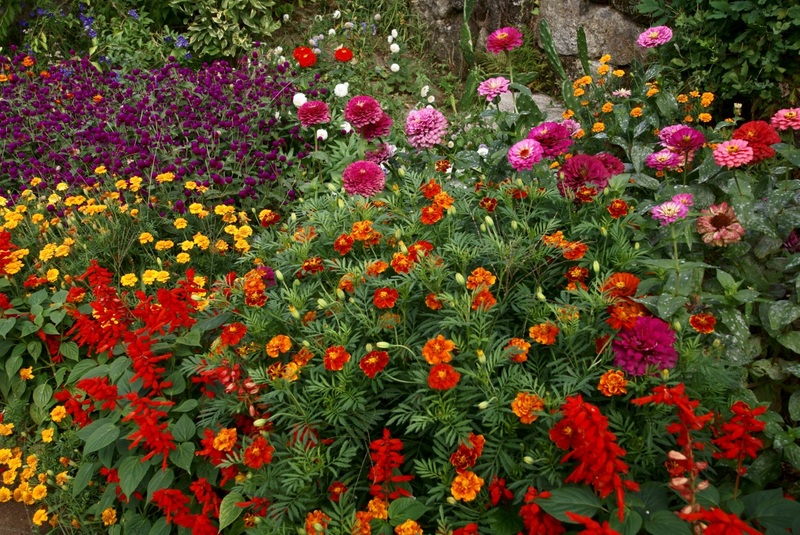 Zinnias and other culture in group plantings. Culture is very sensitive to frost, autumn and spring. Most often it is propagated by seeds. The first stage is soaking planting material in a wet rag, strong seeds hatch in three days. The best choice is peat pots, depth of seal – 1 cm, time of sowing – the beginning of April. Seedlings it is best to keep on the windowsill, the optimal temperature 22 to 24 degrees. Long shoots can be sunk. In late may, the plants stand on a balcony or terrace for hardening. Planting in a permanent place produce in June, after the spring frosts. The distance between the bushes – 35 cm. Culture tolerates transplant, if the plants move along with the ball of earth. In southern regions, growers propagated without the zinnia seedlings, sowing the seeds in the ground in April. Too thick the seedlings thinned. Zinnia delight flowering after two and a half months after sowing. Each flower does not wither during the month, two months later the seeds ripen, which retain good viability for two to three years. Culture is used to planting on beds, in large and small groups, looks good in the vase life. The flower can be grown on balconies and in containers, preferred short and medium varieties with short stems, stable against the wind. Flowers long stand in a vase, cut them in half condition. The ends of the cut stems in hot water or fired. 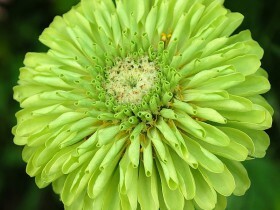 To revive wilting bouquet can, if you place zinnias in hot water and refresh slice. Before the frost low-growing zinnias are dug with a lump of earth and planted in large pots, abundantly watered and kept at room temperature in the light. The plant will long continue to decorate the apartment or house. In the photo: a bed of zinnias. More attention gardeners deserve and georgiacities pompon zinnias, least frequently used varieties of the group "fantasy". In the sale often sold a mixture of different types. "Crimson Monarch" – Bush to 70 cm in height, spreading. Inflorescences dense, Terry, dark red. Blooms from the middle of the first month of summer and until frost. "Violet" – Bush to 75 cm in height, inflorescence purple, dense, Terry. "Lavender Queen" – Bush to 80 cm in height, flowers – lavender with a purple tint. "Polar bear" or "polar bear" – to the bushes 65 cm in height. Terry inflorescences, dense, white-greenish. "Orange king" – spreading shrub to 70 cm in height. Blossoms bright, red-orange, large, Terry. "Purple Prince" – bushes to 60 cm in height. Inflorescence – large, purple. "Tango" – Bush semi-spreading, to 70 cm in height. Inflorescence orange-red, loose. "Rose" – spreading shrub to 65 cm in height. Inflorescence sredneplotnyh, color – pink, with different shades. "Purple" – spreading shrub to 80 cm in height. Inflorescence large, loose, bright red. "Cherry Queen" – Bush height up to 70 cm. Baskets – large, dark cherry. "Envy" – bushes to 70 cm in height, inflorescence – Terry, green. The flowers look unusual, it is interesting to look at the purple-pink background in the vase life. 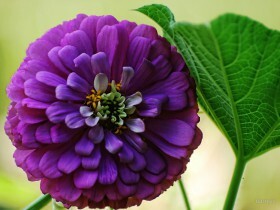 In the photo: varieties zinnia”violet Queen”. "Tom thumb" – Bush to 45 cm in height. Inflorescences dense, Terry, bright red. "Red riding hood" – Bush to 55 cm in height, spherical. Inflorescences dense, bright red, rounded or truncated cone shape. Variety change "Thumbelina" includes plants up to 45 cm in height. Erect annual branched shrubs to 40 cm in height. The leaves are elongated, with a broad base. 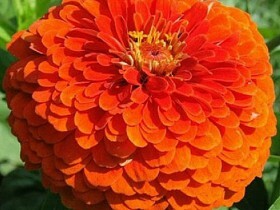 Flowers – small, bright orange, solid, semi-double and simple, Middle – black and brown. In the culture since the mid-nineteenth century. A well – known grade - "sunshine". Branched plant up to 25 cm in height. Inflorescences small, Terry, the coloration is red-brown and dark orange. The most common attack – powdery mildew. To avoid illness, you must take care of correct and adequate air circulation, irrigation performed only at the root. 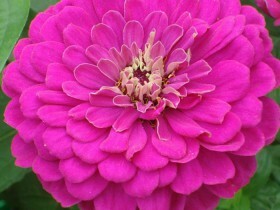 The zinnia can affect root rot, Fusarium, dry rot of the stems. Insects and slugs, can damage – aphids, snails, spider mites, chafer. To fight uses appropriate chemicals. All content on this site SamDizajner.ru written specifically for Simdesigner, copying 1 in 1 strictly prohibited. Reprint, full or partial rewriting of the article “Zinnias – care, landing, varieties”, possible, only when you specify the full, active link to the source.